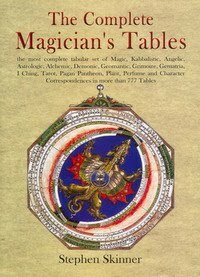 These are the most complete set of tabular correspondences covering magic, astrology, divination alchemy, emblems, Tarot, the I Ching, Kabbalah, Gematria, grimoires, angels, demons, pagan pantheons, plants, perfumes, incenses, stones, religious and mystical correspondences currently in print. It contains more than four times more tables than Crowley`s Liber 777 The source of the data in these tables ranges from unpublished manuscripts, mediaeval grimoires, Kabbalistic works, Peter de Abano, the Abbott Trithemius, Albertus Magnus, Henry Cornelius Agrippa, Dr. John Dee, Dr. Thomas Rudd, Tycho Brahe, S.L. MacGregor Mathers (and the editors of Mathers` work, Aleister Crowley and Israel Regardie), to the most modern theories of prime numbers and atomic weights. The older sources include many key grimoires such as the Picatricx, Clavicula Salomonis, Sworn Book, Liber Juratus, Heptameron, the Lemegeton (with Goetia, Theurgia-Goetia, Almadel, Pauline Art), Grand Grimoire, Grimorium Verum, Sacred magic of Abramelin, and in the 20th century, the grimoire of Franz Bardon. All of this material has been grouped and presented in a consistent and logical way covering the whole of Western Mystery tradition and relevant parts of the Eastern tradition.